Emancipation Address 2018 is officially lit!!! A Brooklyn born & raised activist and a first generation American of Jamaican ancestry, Leslie Mac works every day to lift up the voices & experiences of those most effected by racial injustice and white supremacy. After organizing the NMOS14 vigil in Philadelphia, she created the Ferguson Response tumblr to connect nationwide efforts supporting the important racial justice movement started in Ferguson, MO. Since then she has expanded the Ferguson Response Network to provide additional support for organizers working to create lasting social change through sustained civil disobedience, civic action and grassroots community work focused primarily on Black Women. In 2016 she created Safety Pin Box, a monthly subscription service for white people striving to be better allies in the fight for Black Liberation running operations for the company through is dissolution in 2018. Now, she speaks nationally about connecting social media to social justice and facilitating movement building discussions. And facilitation workshops with organizations, groups and congregations who are working to dismantle white supremacy within their institutions, policies and procedures. She is also the Producer & Host of the Podcast, Interracial Jawn. You can become a direct Patron of her work and access exclusive content via Patreon at https://www.patreon.com/LeslieMacLifestyle/memberships! 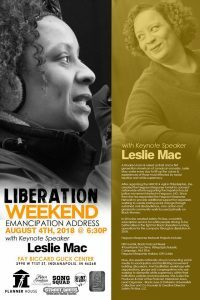 I hope you’ll join us for an inspiring and empowering Emancipation Address with Leslie Mac on August 4th, 2018! → Black Owned Business Block Party 3!